I’m singing ‘Let it gooooo, let it gooooooo. . . ‘ now, as I realize that this post was to have gone live three months ago, and it’s just happening now. After our rockstar Frozen birthday for Cora, well. . . life got in the way. So here it is. 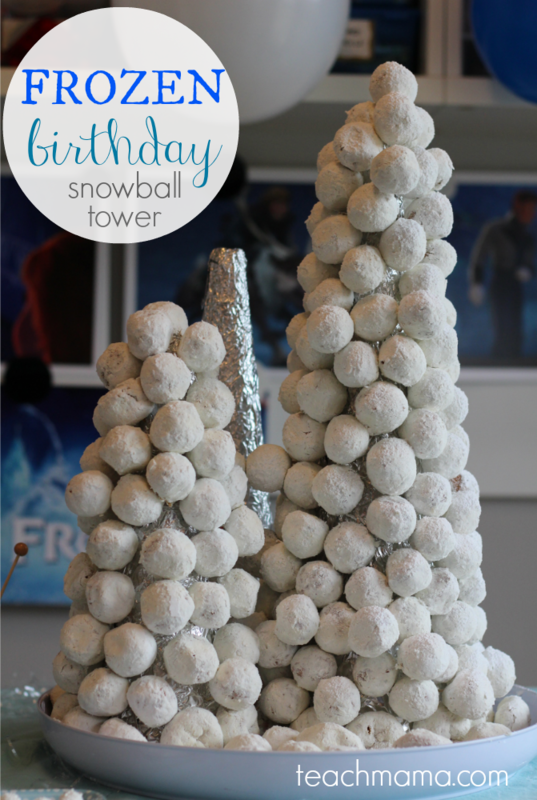 The companion post to our Frozen snowball tower post, here’s our Frozen birthday party: best ideas for crafty kids. 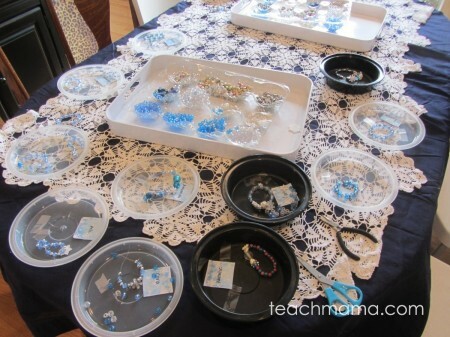 It’s everything else we did for Cora’s Frozen birthday–the crafts we made, the activities, and everything that made it awesome. Cora knew what she wanted to do from the start–she wanted to have a Frozen birthday and watch the movie with her friends. But I knew that we needed a little bit more than just the movie for her party. Cora knew from the start that she wanted to watch the movie Frozen, so that was one of the main activities she wanted. But she also wanted to do crafts. Big kid crafts because really? Her friends were seven after all. 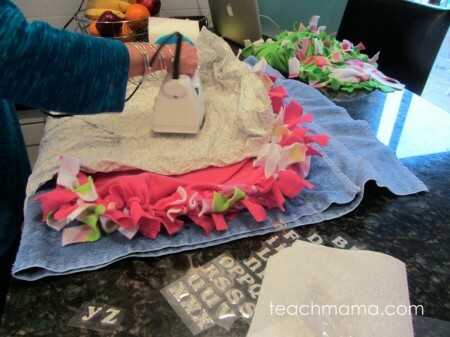 We came up with a two craft party plan: 1. make-your-own cozy fleece blanket; and 2. 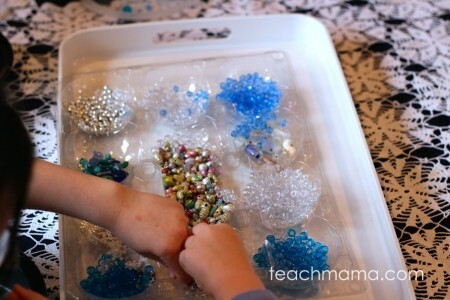 Frozen sparkly bracelets. 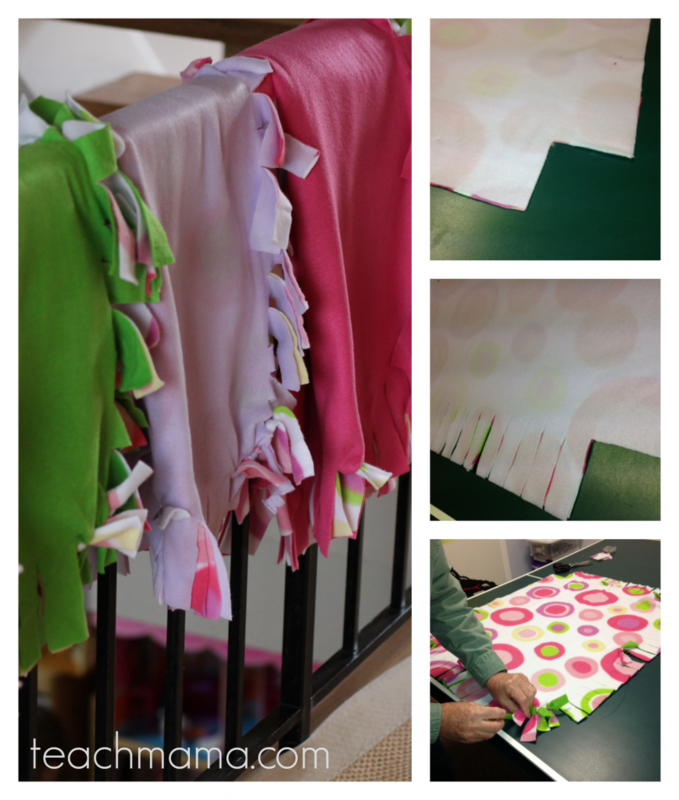 Make-Your-Own Cozy Fleece Blanket: We thought these would be fun so that the girls could get all comfy while they watched the movie, and they’d have a usable gift to take home after the event. 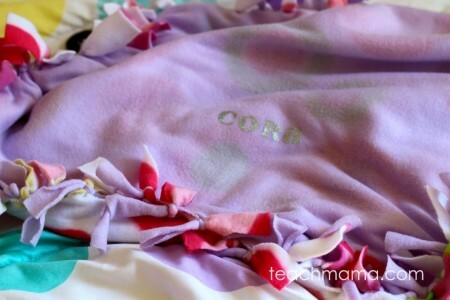 Plus, Owen made a fleece pillow at one of his buddy’s parties a few months back, and I loved, loved the idea. My amazing mother-in-law helped me a ton with the fleece blanket part of this party because she’s not only a crafty crafter, but she’s a math whiz. For our blankets, because we were using them as party favors, we really did want to keep cost in mind. Fleece comes in different weights or thicknesses and can vary greatly in price. We wanted ours to be nice but we knew we didn’t need super-high end here. We bought 7 yards of solid fabric and 7 yards of print fabric. The solid fabric was less expensive, at $3/ yard and the heavier weight print was on sale for $6/ yard. 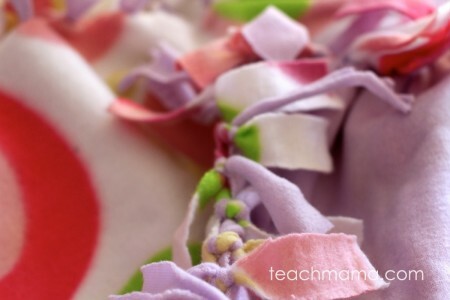 We made two blankets/ 2 yards with each blanket using a total of two different pieces of fleece—a top and bottom, a solid and a print. 1. We cut each yard in half to make two 30x 36” blankets per yard of fabric. To cut the fabrics, lay out the fabrics together, one on top of the other, with the ‘good’ sides both facing out. 2. Trim the outside edges slightly to make them even, and then cut down the middle. 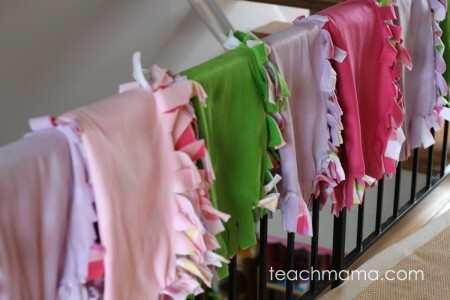 You’ll have two complete blankets, each about 30” x 36”. 3. Next, with two fabrics still together, cut a 3” square from each corner. 4. Then cut strips of 1” x 3” along each side to be knotted together. 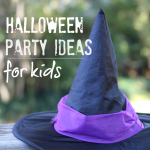 The idea is that the kids can tie the pieces together as an activity during the party. 5. 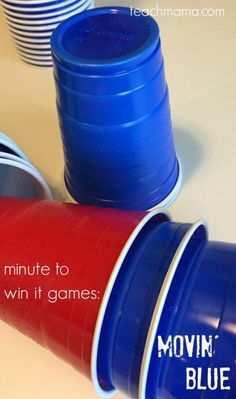 Tie several knots at each corner and one knot along each side to make it easier for the kids. 6. 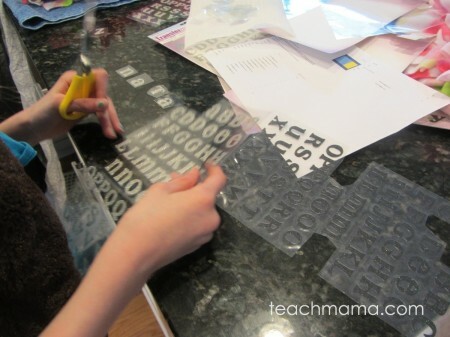 Iron on the letters following package directions and place wherever children would like! 7. 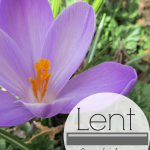 Get cozy, pop some popcorn, and enjoy your fleece blanket! 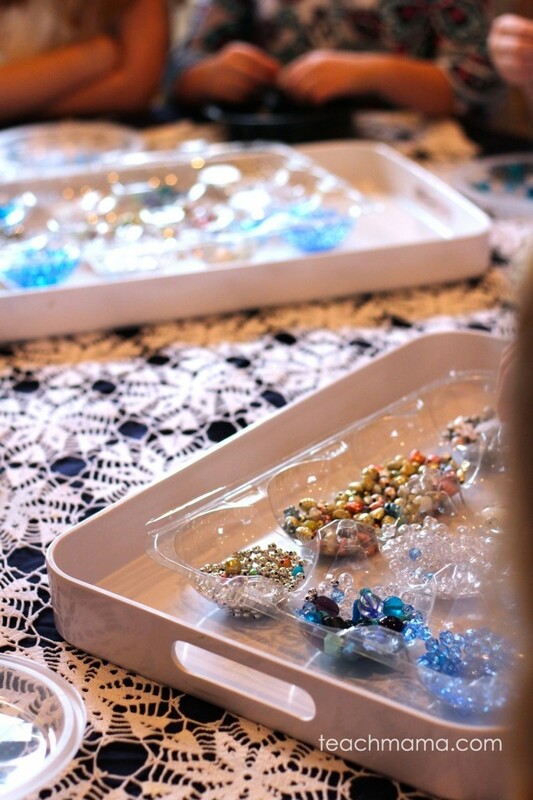 The second part of the party activities involved having the kids make super-awesome, sparkly Frozen bracelets. Brace yourself. These were goooooorgeous. This was super-easy, but because the girls are getting older, we did want the bracelets to be a little more special than the big-bead bracelets they made when they were younger. 1. 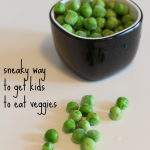 Give each child a tray and a 10″ piece of Powercord. 2. Tape one end of the Powercord to the tray. 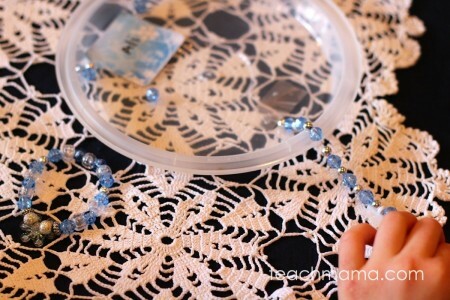 This will make stringing the beads easier! 3. 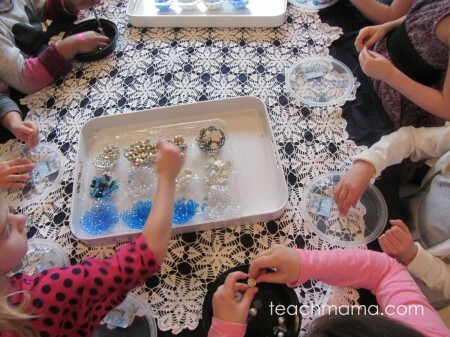 Make sure all of the beads are in small containers so that the kids can easily see them. 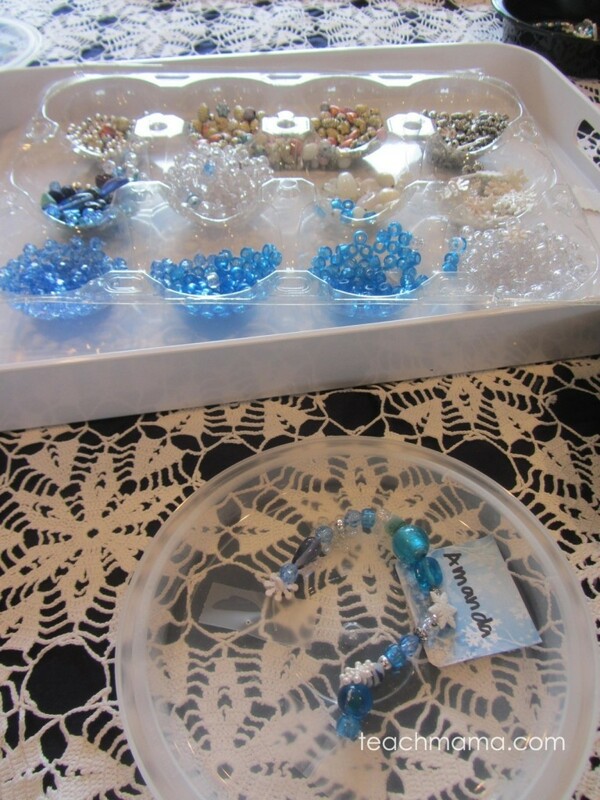 Let them choose beads for their bracelet and add them to their tray. I closed the bracelets for the girls because this was a little tricky. 5. To close the bracelets, bring both ends together, and then grab one of the crimp beads. The deal with the crimp beads is that they hide the ends of the Powercord. 6. Put the crimp bead on one side of the Powercord, and then thread the other end through in the opposite direction. 7. Squeeze a drop of G-S Hypo cement into the crimp bead, and then use the pliers to squeeze the crimp bead shut. 8. Cut the ends of the Powercord off, and let dry! 9. Once the bracelets were dry, we put them in the tiny organza drawstring bags so that the girls could take them home safely. So pretty! The kids had fun. A lot of fun. 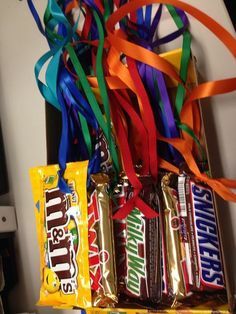 We started the party with the bracelet craft so that the kids could have fun doing something while they waited for their buddies to arrive. Then once everyone arrived and bracelets were finished, we moved over to the living room for blankets! 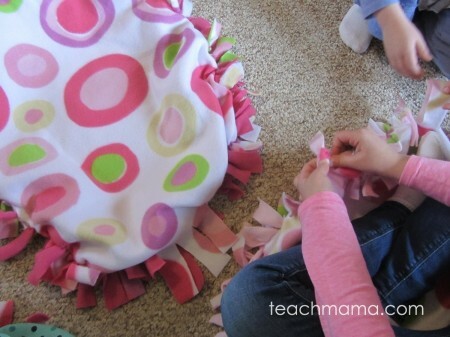 We did a quick demo about how to make the blankets, and then we got rolling! We had all of the blankets draped on the staircase, and we asked the girl with the next birthday to choose her pattern first and so on. Luckily for us, we had my husband, Maddy, Owen, and my mother-in-law to help because the girls had a bit of a tough time with the tying. Most managed with a little help–granted, these girls are only in first grade–some got a little frustrated. 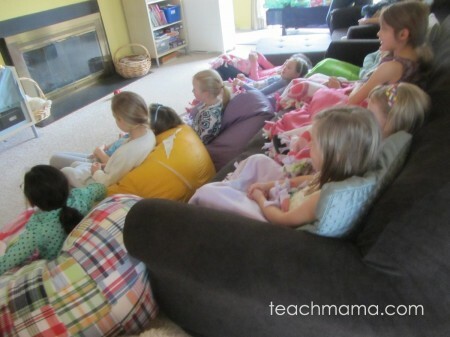 After blankets were finished, we turned on the movie, and the girls sat back, relaxed, and watched! 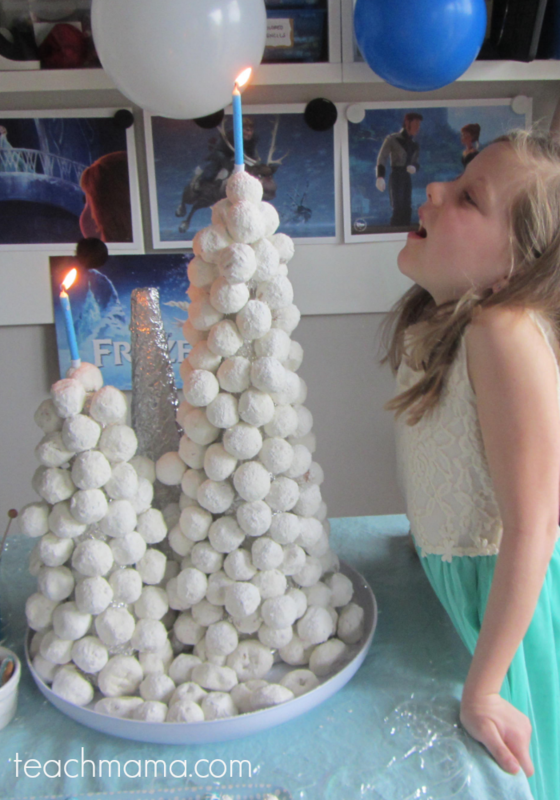 We took a break mid movie for Frozen snowball tower and ice-cream bar. 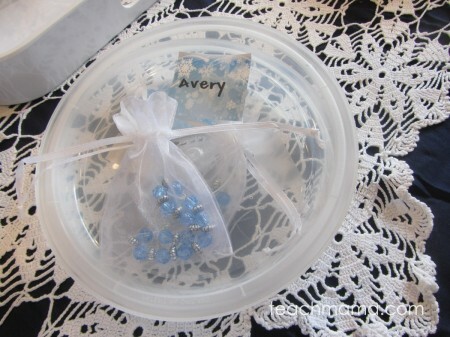 By that time, I had closed off all of the bracelets, put them in tiny bags and added the bags to their larger goodie bag. 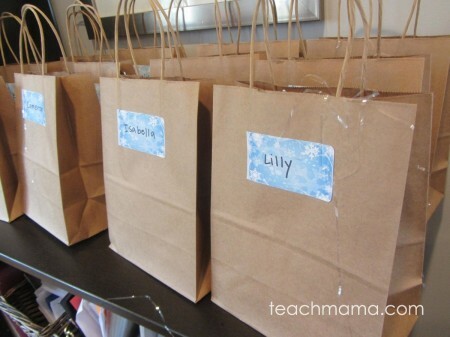 All we did for the larger bag (a plain paper bag) was add a little snowy-type sticker to the bag with each girl’s name on it. I did want a bag for them to carry their blankets home safely, and these worked perfectly! Want to see the food we ate? So cute!! 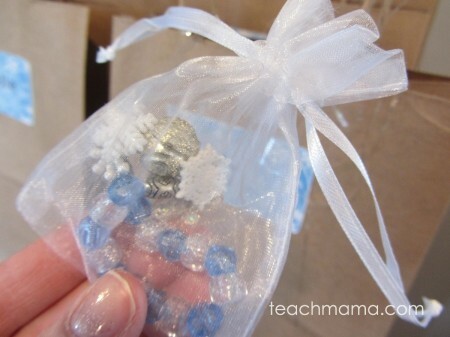 What a perfect way to bring frozen out of the tv screen and into your home!